Virginia Gov. Ralph Northam pauses during a news conference in the Governor's Mansion in Richmond, Feb. 2, 2019. Northam is under fire for a racially insensitive photo that appeared in his college yearbook. Demonstrators hold signs and chant outside the Governor's Mansion in Richmond, Va., Feb. 2, 2019. 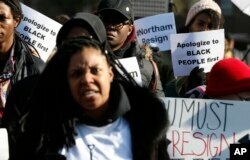 The demonstrators were calling for the resignation of Virginia Gov Ralph Northam after a decades-old, racially insensitive photo from his medical school yearbook page was widely distributed Friday. In a video statement Friday, Northam said the photo does not reflect the person he is today. He added that "I cannot change the decisions I made, nor can I undo the harm my behavior caused then and today. But I accept responsibility for my past actions and I am ready to do the hard work of regaining your trust." Biden tweeted Northam "has lost all moral authority" and said Lt. Gov. Justin Fairfax, who is African-American, should move into the governor's office. Pelosi said Northam should "do the right thing" by stepping down and letting Virginians "heal and move forward." "Ralph Northam has had three decades to know better but only now does he acknowledge this racist act," the Congressional Black Caucus posted on Twitter. "An apology now isn't enough. He must resign." The Virginia Legislative Black Caucus posted a statement on Twitter that said of Northam: "We fully appreciate all that he has contributed to our Commonwealth. But given what was revealed today, it is clear that he can no longer effectively serve as Governor. It is time for him to resign, so that Virginia can begin the process of healing." "Leaders are called to a higher standard, and the stain of racism should nave no place in the halls of government," presidential candidate Sen. Kamala Harris, a California Democrat, posted on Twitter in her statement urging Northam to resign. "The Governor of Virginia should step aside so the public can heal and move forward together." News of the photos from Northam's medical school yearbook came a week after Florida's secretary of state resigned; photos from a 2005 Halloween party showed him in blackface while dressed as a Hurricane Katrina victim. The Virginia Legislative Black Caucus perhaps explained best in its statement why the photo is resulting in calls for Northam's resignation: "(W)hat has been revealed is disgusting, reprehensible, and offensive. ... The legacy of slavery, racism and Jim Crow has been an albatross around the necks of African-Americans for over 400 years. These pictures rip off the scabs of an excruciatingly painful history and are a piercing reminder of this nation's sins. Those who would excuse the pictures are just as culpable."